As soon as they’d had a chance to mop the sweat or rinse the vomit out of their mouth, the top finishers of the Chicago Marathon stiffly climbed to the stage in the media center to answer reporters’ questions that generally elicited thanks to the Chicago Marathon for putting on such a great race and magnanimous credit to the competition and the crowds for their victory. But at the back of the room, a scrum of Japanese reporters formed a bristling cell of energy. Its nucleus was not Suguru Osako, the Nike Oregon Project protege who had just finished third and set a new Japanese record time of 2:05:50. Nor was it Taku Fujimoto, who surprised everyone, even himself, with a huge 2:07:57 personal best. It was Yuki Kawauchi, the enormously popular “citizen runner,” apologizing to his fans for his 19th place finish, in 2:16:26. He made no excuses, calling his performance, his 82nd career sub-2:20 marathon, embarrassing. He said he was ashamed. He hung his head. Thank you for sending many comments. And I am sorry for everyone. Because Osako broke Japanese national record.And Fujimoto marked 2:07PB. But I was 19th today. 19th is worst place of my WMM. Today many people cheered me at course side. But I couldn’t be nothing. I think I am weakest Boston marathon winner until now. I want to be more strong and more fast. I want to breakthrough again. 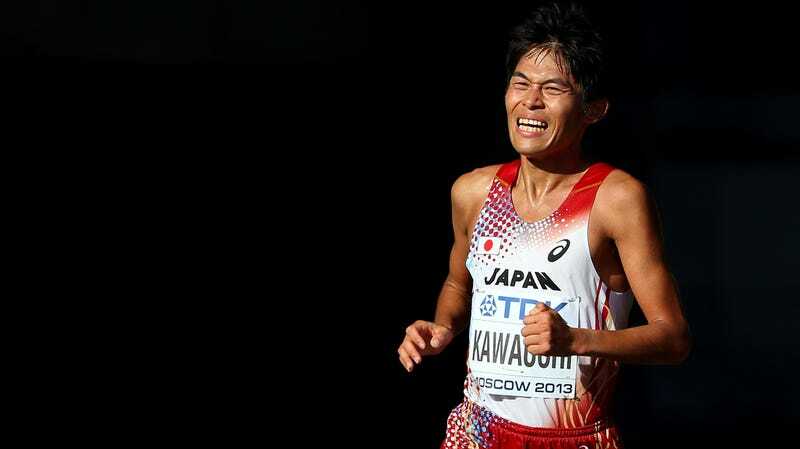 Kawauchi originally broke through in the 2011 Tokyo Marathon when, as a 23-year-old self-coached government worker, he ran by Japan’s top professional runner to place third, in 2:08:37. Since then Kawauchi has been delighting his fans and humiliating the pro running community at the same time, running fast and frequently, and still managing to be back in the office on Monday. Famously, he phoned his boss, apologizing for winning the 2018 Boston Marathon and asking for another day off to attend the award ceremony. He’s run more sub-2:10 marathons since 2011 than the entire running population of the United States put together. He averages 11 or 12 marathons per year (and a few ultramarathons, and loads of half-marathons), while most of his rivals run two. His goal, he said, was to destroy the status quo, to show people a different way to approach running, and life. Just after winning this past April’s Boston Marathon, the World’s Favorite Amateur Marathon Runner announced he would shed the amateur mantle, and go professional. I spoke with Kawauchi the Friday before the Chicago Marathon about this transition. Brett Larner, editor of Japan Running News and Kawauchi’s de facto agent, translated. Deadspin: I want to look at your decision to go pro. But first, your situation now: As a government employee, you can’t have outside income, but you accepted prize money, right? Yuki Kawauchi: Yes. That was okay because prize money is not considered salary. It’s a reward, a one-off thing. DS: Including the Boston purse of $150,000, how much in prize money have you earned in 2018? DS: Is that more or less than your income from your administrative job? YK: About four to five times what I make from day job. DS: Do you accept travel expenses, entry fees, or hotels from race directors? YK: Yes, those are no problem. DS: You announced in April you’d be quitting your job and going pro in April 2019. Why wait for a year? YK: March 31 is the end of the fiscal year and I wanted to honor my obligation to my job. DS: When I last talked with you in November 2014, I asked why you didn’t quit your job then. You said your schedule was working for you and that if you only had to think about running twice a day, you might run too much or you might lose interest in running. What changed? Why have you decided to go pro? YK: In 2014 I was coming off of a year when I’d broken my personal best several times, so I thought there was room for growth. But in the four years since then, I haven’t broken my personal best. I came to see the limitations of my current situation. Before the London World Championships [Kawauchi represented Japan in the marathon] I took 10 days off work, when I was only dealing with the marathon. I was starting to think that would be the approach I might need to take the next step. Also, my younger brother, Yoshiki, had quit his job and gone to full-time running, and had improved significantly. DS: Are you afraid you’ll run too much or lose interest in running? YK: No. Four years ago, I was younger and less experienced. I didn’t really understand what going pro would involve. Seeing my younger brother improve his marathon time by five minutes [Larner points out that Yoshiki improved to 2:17 which, while impressive, is not at the top level Yuki is] influenced me. I saw that [quitting my job, going pro] could free me up to do more things—training and events with children. I want to inspire others to run for fun, for the love of running. DS: What exactly does that mean—go pro—other than just quitting your job? Will you accept appearance fees? YK: Two things: One, it will be possible for me to do things like going on focused training camps, to get away from the summer heat. At the moment, I’m thinking of spending the summer in northern Japan. It will give me more freedom to spend time overseas. Right now when I travel, I’m on a very tight window [he arrived in Chicago on Wednesday, a day earlier than usual, but flew back on Monday as usual]. And two, it will free up financial restrictions. I’ve always bought my own shoes and equipment. DS: Have companies approached you about sponsorship, or did you approach them? DS: What will your days look like as a pro? What will you do with that nine hours when you used to be at work? YK: Of course I’ll spend more time training, but aspects of training I haven’t had time for. For example, I’ve never had proper time for recovery. I mentioned getting away for the summer to train in a cooler location. This past summer was a very hot but I was not able to get away because of my job. I don’t train well in heat and humidity; I put together the best training I could but I don’t think I’m in personal-best territory [for Chicago Marathon]. I’d really like to come back to Chicago next year after I’ve had time to do things in training. I think I could be more competitive, and faster. DS: Your reputation has been built on being a working man, a citizen runner. Will your fans feel like you’ve sold out? YK: There will be people who will stop being fans, but there will be plenty who continue, and also new fans. I look at that as a challenge. Reaching out and inspiring more people is a goal of mine. DS: As an elite runner working a full-time job, you are bucking the status quo, which is your motto, your goal. Can you still be “destroying the status quo” as a professional? YK: [laughing] Of course, yes! Even though there are other pros outside the corporate system, they’re not open, they’re relatively closed, and aren’t interested in sharing their running with others. There’s nobody doing what I want to do. Top level pros outside of the corporate system go to Kenya because they think that’s what runners should do. It often doesn’t work out. It’s about doing what suits you. I want to be in an environment that suits me regardless of whether it’s what others are doing. I also intend to continue to race a lot which most pros don’t do. I want to inspire people to follow a route that’s right for them. DS: Since 2011, you’ve talked about upsetting the status quo and showing runners a different way of doing things, and yet, the fantastic results from the 2018 Tokyo Marathon [nine Japanese men ran under 2:10, including a national record, 2:06:11] were achieved by corporate runners training in much the same way, and it was run in Japan—all status quo. Has anything changed in Japanese running? YK: Japan had a period of inward looking, when people only raced domestically. But now, more people are racing overseas, and doing well. I’m proud of being a part of that. The people in that race benefited from Japan being more outward looking. DS: Speaking of the 2020 Tokyo Olympics, you are maybe the only top runner who isn’t focusing on it. Why is that? YK: I don’t run well in heat and humidity, so I would be a waste of space on the Olympic team. For me, I’d rather turn that hard training toward a fast marathon in Berlin or Chicago, where the weather is more conducive to running.